For many years Dymphna and I have been fans of Oleg Atbashian and The People’s Cube. The satirical art and articles at the TPC are brilliant and hysterically funny. Nobody does better graphics than The People’s Cube. A few days ago Mr. Atbashian was arrested at George Mason University and charged with destruction of property, a Class 6 felony. His crime? 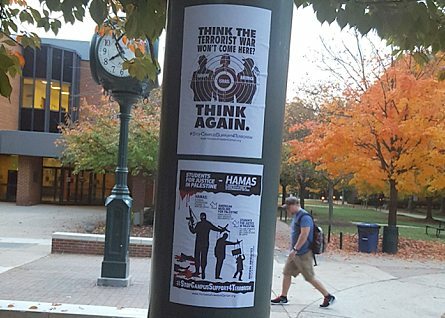 Putting up posters and stickers opposing Hamas and the terrorist-friendly campus groups that support Hamas. The charges against him and a colleague kept them both in a Fairfax County jail cell until they could raise the $8,000 bail. If convicted, they may face five years in prison. Such is life in Obama’s America. With Trump’s America coming up in January, will anything change? Will the charges against Oleg Atbashian be dropped? This is a local rather than a federal charge, so it’s hard to say. By the way: I’m willing to bet that pro-Hamas activists on campus could have used any kind of glue they wanted to put up their anti-Zionist posters, without fear of being arrested and charged. You can read more about what happened to Oleg Atbashian in Daniel Greenfield’s column at FrontPage Mag. This entry was posted in Civil Liberties, Counterjihad, Domestic terrorism, Enrichment, Holy War, Islamic Atrocities, Legal action, News, PC/MC, USA by Baron Bodissey. Bookmark the permalink. Thanks! I just renewed my ‘real PC’ post on Facebook, just to keep myself on various ‘lists.’ I’ve worked hard to get there, and ’16 has been a great ‘screwm’ year. Moral of the story – if you escape from the Gulag, the Gulag can come to you… even in the U S of A! Where the rich Jewish Israel supporters? Poupon, look up the expression “non sequitur” please. Actually, it is kind of a sequitur Mark H. Especially since Islamic terrorist have a stated goal to wipe out Israel and all jews. They used to be a Jewish organization staffed with leftists, now it is a leftist organization staffed with jews. They care more about the PC culture than protecting the Jewish students. Google it. Your in for an eye opener. Are graffiti ‘artists’ imprisoned for ‘destroying’ property? Higher education has lost its credibility by embracing political partisanship. Scholars are supposed to aim for objectivity in their work. Now they have transformed universities and colleges into propagandizing re-education camps (although there’s not much RE-education to be done as the teachers’ union is solidly Left, so the kids entering university are already hallucinating). I guess this flagrant miscarriage of justice won’t be reported in NY or LA. They’re too busy supporting the anti-Trump demonstrators who are, (oh no!) – actually destroying property!!!! GMU was a conservative school not that long ago. There needs to be a national delousing program run out of the Trump Dept. of Education. Good grief! Doesn’t everybody put up posters and stickers on college campuses? My guess is that what happened is the most banal possibility one can imagine: the administrator-bureaucrats had no clue as to the issues involved, and didn’t really care, but they realized criticizing Muslims involves a real risk of violence. So, they took the easiest way out, and charged vandalism. One should not look to ideas from bureaucrats, even evil ideas. Their entire world revolves around extending their bailiwick of influence, and avoiding any real controversies until time for retirement.